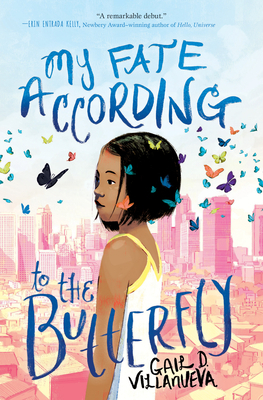 Light and deep, smart and funny, crushing and hopeful all at the same time, My Fate According to the Butterfly will open your eyes to both the world's potential for magic, and to its harsh realities. When superstitious Sab sees a giant black butterfly, an omen of death, she knows that she's doomed! According to legend, she has one week before her fate catches up with her -- on her 11th birthday. With her time running out, all she wants is to celebrate her birthday with her entire family. But her sister, Ate Nadine, stopped speaking to their father one year ago, and Sab doesn't even know why. If Sab's going to get Ate Nadine and their father to reconcile, she'll have to overcome her fears -- of her sister's anger, of leaving the bubble of her sheltered community, of her upcoming doom -- and figure out the cause of their rift. So Sab and her best friend Pepper start spying on Nadine and digging into their family's past to determine why, exactly, Nadine won't speak to their father. But Sab's adventures across Manila reveal truths about her family more difficult -- and dangerous -- than she ever anticipated. Gail D. Villanueva is a Filipina author born and based in the Philippines. She's also a web designer, an entrepreneur, and a graphic artist. She loves pineapple pizza, seafood, and chocolate, but not in a single dish together (eww). Gail and her husband live in the outskirts of Manila with their dogs, ducks, turtles, cats, and one friendly but lonesome chicken. My Fate According to the Butterfly is her debut novel.